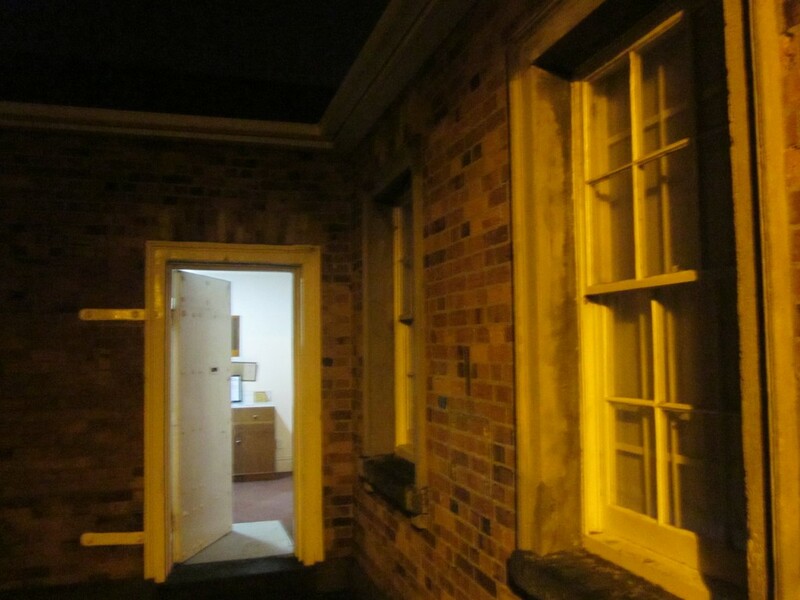 Haunted Auckland investigates the Onehunga Blockhouse to try to uncover what spirits may be residing in this nineteenth-century stronghold. Check out our exclusive audio evidence! 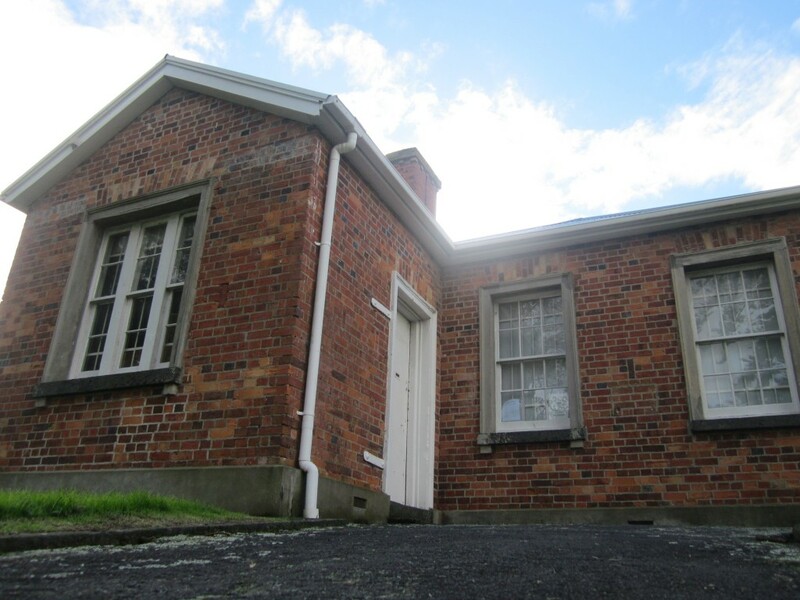 The Onehunga Blockhouse is a significant example of nineteenth-century colonial military architecture dating from the era of the 1860’s New Zealand Wars. 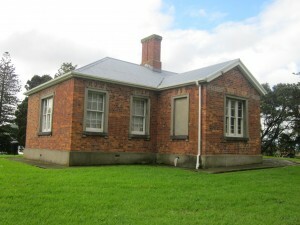 One of few surviving blockhouses nationally and possibly the only example constructed by a public body in brick, the Colonial-Georgian style building is the sole remaining blockhouse of twelve defence strong posts built in and around Auckland in 1860. It was designed to be cruciform in shape, with sturdy brick walls 11 inches in thickness. The heavy panel doors were plated with heavy gauge sheet iron to ensure protection and sash windows provided ample light. The only weak point in the building’s defence protection was the roof constructed with Kauri shingles. However, sacks and barrels of water were held inside to be used in the case of fire. Originally, the Blockhouse had a wooden interior with lath and plaster internal linings, but the internal linings were later replaced with timber boarding. It was sited with unobstructed views over the area of the Manukau Harbour, and built with brick walls nearly a foot thick, steel-plate doors and shutters and fire-fighting gear on hand! Blockhouse was built with symmetrically located openings, basalt window sills, and classically derived architrave surrounds, suggesting a public structure of some importance. It was a comparatively early example of brick construction in colonial Auckland. Internally, the cruciform plan was divided into two by a partition wall and back to back fireplaces. Two smaller rooms provided covered entries.. Relatively large sash windows were protected by iron shutters fastened from the inside. In New Zealand blockhouses – free-standing defensive structures erected to house guns and to protect gunners and ammunition from attack – were generally based on eighteenth-century North American designs of timber construction. Prior to the arrival of Europeans, Onehunga was occupied by Maori tribes including Te Waiohua and Ngati Whatua. In 1847, following the founding of Auckland as colonial capital in 1840, Onehunga became the first of four military ‘Fencible’ settlements established around the southern side of Auckland. 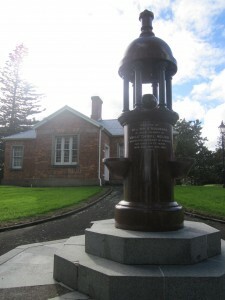 The Onehunga Blockhouse was constructed by contractor John Redwood and was given into the custody of the 2nd Battalion of the Auckland Militia on 6 December 1860. 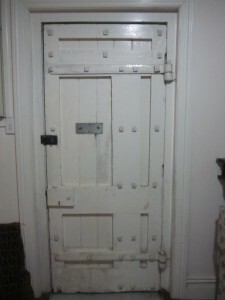 Linked with the Second New Zealand – or Waikato – War (1863-4), iron sheeting and heavy iron hinges were fixed to the plank doors in 1863. From 1863 until 1865 the Blockhouse housed twelve militia. However, it was abandoned as an inadequate defensive structure as the population of the area grew. After 1865 the building – never the subject of armed attack – ceased to have military significance and was abandoned later that decade. From 1870 until 1873 it was rented to The Rev. G Brown, a Presbyterian minister, who used the building for a private school. It was given to the Onehunga District Board in late 1875 and let for residential use after timber linings were added in 1877. The Borough Council occupied the building from 1889 until 1892 adding extra accommodation in 1889. The surrounding land was laid out as a reserve, and vested in the Board in 1881. 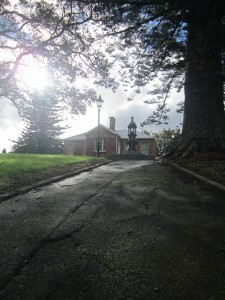 In the 1880’s it housed the family of the Green Hill Reserve caretaker, and from 1889 until 1892 was the Onehunga Borough Council office, at which time an addition was built. Returned to residential use after 1894, gun loopholes were bricked up early in the twentieth century. Green Hill Reserve became Jellicoe Park in 1921, a year before the Neilson drinking fountain was constructed in the Blockhouse grounds in memory of a local businessman. During the 1920’s the place was known as Jellicoe Lodge, and a bathroom was added. Having fallen vacant in 1956, the blockhouse underwent a refurbishment completed in 1966. 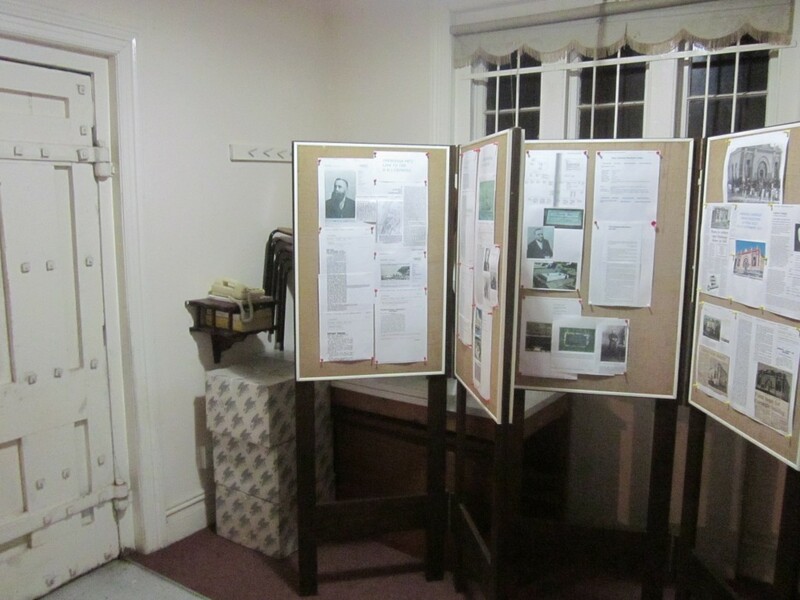 The blockhouse was used for meetings of the local Lions Club and the historical society and remains in use by the Onehunga Fencible and Historical Society, a tenant of over four decades. 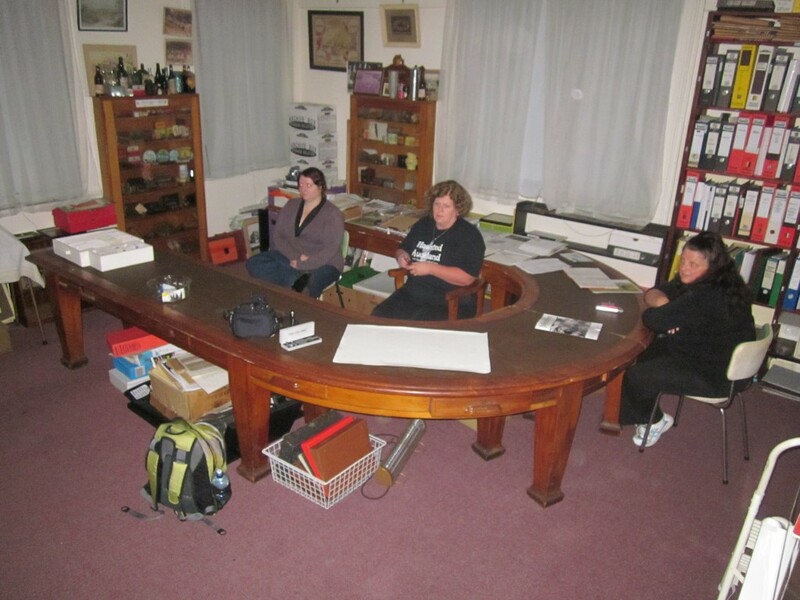 Team members for this investigation – Mark, Barbara, Jacalyn and guest Chris. Weather conditions on the night – Heavy rain during the day that eased off to light periodic rain in the evening. Lunar Cycle – Day before first quarter. Inside Temperature – fluctuated between 16.5 – 17 degrees. The Blockhouse is a single storied brick house. There was a small entrance room, two larger rooms and a toilet/service area. It had been remodelled quite extensively and I had difficulty envisaging where the original rooms had been despite a floor plan being displayed in one of the two main rooms. One of the large rooms had been set up with theatre style seating at the time of our visit and it appeared to be used by a Lions group. The group arrived at the Blockhouse around 8:30pm and started setting up. Static video cameras, handhelds, positioned audio recorders, EMF and various atmospheric meters on hand to collect data. We also conducted communication sessions with and without the use of a ‘Spirit box’ (a piece of equipment the group is trialling in the name of open-mindedness, allegedly used to aid in spirit communication). All sessions were recorded. As the rooms were rather large, Barbara set up a monitored laser grid in an attempt to catch some form of activity or movement. At just over 150 years old, the Blockhouse is an aptly named strong brick ‘block’ building. The original plans of the building show that once entering through the steel faced door, you had the third and smallest bedroom directly to your left. To your right would be two doors. One leading to the lounge, the other to the largest bedroom. Both these rooms share a common wall, each with a fireplace in either room at the same point on the wall allowing them to share the same chimney. The second bedroom is accessible only through the dining room, off the lounge. Currently as it stands, the original wall that separated the first and second bedroom have been removed making for one large room, the same size as the lounge. The dining room is no longer and has been updated to be new toilets. The lounge is now used as a meeting room for Lions Club, and is adorned with plaques and Lions banners. What was bedroom one and two, is now a room that holds a lot of historical paperwork to do with the area. The team, a small group this time spent time in each room of the building. Full photographic sweeps of the interior and exterior were taken. Temperature readings in each room at two points during the section. Communication attempts in two of the main rooms. Continual video camera (infra-red and standard) and audio recorder surveillance in the rooms also. Jacalyn – The Blockhouse had more of a musky smell, and didn’t seem to have been opened up in a while. It was obviously used less frequently by people as evident by a fallen painting from the wall that seemed to have gone unnoticed. The records kept in the building go back a long time. Barbara – I thought we were getting some promising results by the end of our session in the second room. There appeared to be some possible activity near the fireplace. During our investigation of the Blockhouse I thought I could smell mothballs for a few minutes towards the end of the investigation but that faded. The whole room at the Blockhouse dropped a degree during our investigation. We decided, however, that was probably just a normal fluctuation. I recorded the whole investigation including various EVP sessions that were done in both main rooms here.. We asked questions which would help us ascertain the identity of any spirit we had possible contact with and questioned their attachment to the building. Our audio recording sessions don’t seem to have been particularly successful but we do seem to have caught an interesting sound. As we were finishing up some of our group heard what sounded like a woman murmur and this was captured on two audio recorders. To date the group has been unable to debunk this possible disembodied voice. Jacalyn – During our EVP session in one of the rooms of the Blockhouse I heard a noise, but couldn’t say what it was. At the same time both Barbara and guest Chris said they had heard a woman sigh. It was heard again a few moments later, this time by Mark as well and I was able to confirm it was the same sound I’d heard just before and it sounded like a sigh. Both mine and Barbara’s audio recorder picked up on this. The first session here was in the main meeting area in the Blockhouse. It was in this room that a couple of possible EVP’s were found. On the wall of the room was a ‘In Memorial’ Plaque , but some only listed there by a first initial. While trying to guess what the name could be both mine and Barbara’s recorder picked up a long ‘Ahhhhh’ sound on our devices. I do not know what it could be, but find it interesting both our device’s picked up on this clearly. Regularly towards the end of our EVP session in the Blockhouse there was a tap that could be heard. This was the same tap I’d heard in the other room of the Blockhouse where we’d done another EVP session. After listening to my recordings of the night I feel that this isn’t anything paranormal. On the night of the investigation it was rather windy with periodic rain. I think the tapping noise may have been made by the wind causing something to move and hit the wall e.g. a pull cord for Venetian blinds. This is a hard one to verify as different people seemed to be hearing it coming from different locations. Barbara set up a laser grid on the wall. This would mean if anything dark moved through the in front of the laser it would be obvious. Nothing occurred, but it was still good to see it in action. During our second EVP session in the other room of the Blockhouse both Barbara, Chris and myself heard what sounded like a sighing ‘Hmmm’. This was picked up by both our recorders. Soon after it happened again, this time also heard by Mark. To me the sound seemed to be coming from the back of the room near where Chris was sitting. Also during this session in the Blockhouse, in what was room one and two, both Barb and I felt the temperature drop. The temperature in the room was checked, as well the temperature from our legs where we were feeling cold, but there ambient room temperature had only seemed to go down by one degree. Barbara – The Blockhouse was not what I was expecting at all. I thought it would have been set up in the original style, however it had been remodelled so that the interior was almost unrecognisable when comparing it to the original floor plan. The building had a neutral feel. It had a much harsher and masculine feeling than Laishley House and felt more like a place of business. I considered that the Blockhouse was probably not haunted. I knew that some of us had heard what sounded like a woman murmur towards the end of our investigation but thought that upon reviewing the audio of the sound I would be able to explain the sound we had heard. However, even after carefully reviewing my audio recording, to me it still sounds like a woman murmurs something and I cannot come up with an explanation for it. Therefore I suspect that we may have experienced paranormal activity at the Blockhouse but cannot define it any further than that at this stage. Jacalyn – Not much happened during the investigation, but I feel that it went well, and we weren’t rushed and were able to take our time. Though the building was quiet, and no obvious activity was experienced, this didn’t mean it was a waste of time – or that there is nothing there. It was good to see a wide array of items used even if nothing was picked up on as it gives a base line to compare against for future investigations. I feel that there is a chance that the Blockhouse may have something residing there, but if there is I’d say it would be residual. Mark – like the Laishley House session we did previous to this, we heard a few random bangs and creaks and temperature drops. Also a scuttling, clicking noise coming from the fireplace/chimney at one point.Due to the atmospheric elements outside, i.e. wind, light rain and the cold night, I am confident these noises and slight temperature fluctuations can be easily explained away as non paranormal events. Aside from the noises, we didn’t have anything happen that would seem unusual, in my eyes. The building certainly had the usual ‘dark quiet building at night’ spookiness, but there were no feelings of unease or creepiness attached to it. The electrical fields within the building were normal and fine, temperatures were steady and normal. No anomalies stood out. Nothing was out-of-place in my photo, video or audio recordings. At this point I can’t find anything out of the norm with the Blockhouse building to lead me to think of it as being haunted.